The Porter Cable Polisher review you better read before you buy. Why this buffer could be your top pick! The Porter Cable Polisher is a top rated car buffer that continues to receive great reviews as well as a dedicated following of enthusiasts and professionals alike. The Porter Cable was really the beginning to what is now a market with many choices for a professional grade orbital car polisher. Unlike the big and bulky random orbital car buffers you may have grown up with, the Porter Cable is a true quality piece of machinery that is incredibly safe and will take your paint to a higher level of shine! What is the Porter Cable polisher? Is the Porter Cable really the safest car buffer? Why choose an orbital polisher over a rotary buffer? Is the Porter Cable buffer a good choice for my needs? What is Darren's personal opinion and tips? Follow along as I help you ask the right questions in order to come to the right conclusions in your search for the best car buffer for you! The Porter Cable buffer (buffer and polisher is an interchangeable term) is what is called a DA (dual action) or random orbital buffer. It has two circulating points to the head which is why it is referred to as dual action. Think of the earth as it spins while simultaneously rotating around the sun. It was designed as a safe alternative to the infamous high-speed, or rotary car buffers, as well as designed to replicate the motion of your hand in the form of a power tool. Random Orbital: Means the orbiting is random and not forced through gear operation. When too much pressure is applied, the spinning stops while the vibrating (some refer to this as oscillation) continues. This is why these random orbitals are so safe; it is virtually impossible to generate too much friction or heat when polishing. The Porter Cable is a random orbital. Forced Rotation Orbital: The second type of orbital buffer is the forced rotation which means that both the spinning and rotation are gear operated and cannot be stopped with pressure. These types of orbitals offer greater polishing abilities as they can produce additional levels of friction and heat as compared to random orbitals, but still lack the ability to create the heat and friction that can be produced through use of high-speed rotary polishers. The Porter Cable is a random orbital, rather than a forced rotation orbital as explained above. Indeed the Porter Cable is often referred to as the safest car buffer and therefore ideal for the true beginner, but the reason this polisher is so safe has nothing to do with it being a Porter Cable, and everything to do with the fact that it is a random orbital buffer. The many car forums are filled with limitless people willing to echo the fact that this buffer not only has a big following, but represents a viable answer to beginners and car polishing. 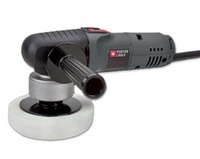 Long has been the cry of beginners and car enthusiasts for a safe alternative to rotary polishers, and numerous manufacturers have risen to perform. Orbitals do represent a safe and effective means of car polishing. But the very reasons these buffers are so safe is the very reasons their abilities are limited. The Porter Cable is capable of whatever type of paint correction necessary, but like all dual-action polishers, they will still be slower than the skilled use of a rotary. While high-speed (rotary polishers) car buffers are consider dangerous by many, this is an unfair label as any tool can be deemed unsafe when used improperly by the inexperienced. The fact is that the latest generation of rotary polishers represent the winning balance for any guy that wants to maximize efficiency in paint correction and also have the badge of honor that goes along with being capable of using a high-performance machine that very few guys today have. These new generation rotary car polishers not only can perform serious paint correction, but due to their decreased operating speed settings, now fine polishing (jeweling) for the removal of holograms (sometimes called swirl marks) can be accomplished. Because of these incredibly low speed settings, (600 RPM's) these rotary polishers are now safe for any true beginner to start with. You can see my top picks in rotary automotive polishers to see if you come to the same conclusion. Because of the quality that continues to be engineered into the dual action, random orbitals, I believe these new generation models are actually the best choice for 99% of any of you reading this.And it is also this reason that the Porter Cable polisher is being left behind as the first choice in a top rated car buffer. As safe as safe gets. 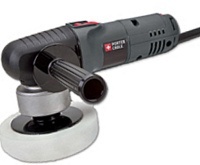 Many professionals and enthusiasts alike never move past the random orbital (dual action) polisher. Ideal choice for any beginner seasoned veteran. Also your answer to a true hologram and swirl free finish. As stated above, the Porter Cable has been losing market share for many years now despite it essentially being first to market decades ago. Other companies have released versions of the very popular dual action, random orbital buffers that have taken over this area of auto detailing. Below are what I consider the winning choices that represent better value, performance, and overall user experience than can be had from the Porter Cable polisher. A true quality and professional grade polisher without over-spending for a hyped-up brand name polisher. Comes complete with popular and professional grade polishes for heavy paint correction to fine polishing. Comes with professional grade polishing pads for heavy paint correction to fine polishing. A true balance of winning features and performance. The perfect kit that contains everything needed to take your paint to amazing levels of depth and shine. The actual car polisher I started with as my first random orbital buffer. A quality polisher, polish pads, polish, and a paint sealant. The last kit 99% would ever need to get. For any of you that are fully committed to learning and mastering the art of high-performance paint correction. This is a serious tool and a serious paint correction kit. The last paint correction kit any of you would ever need. When you are ready to go level 10 with quality and a true professional image! Amazing build quality and ergonomics in a car buffer. So just start, get your feet wet, and develop your skills and interest. Then you can over-think it as you progress in your interest and skill set. But if you keep analyzing and never pull the trigger, you will remain in this holding pattern indefinitely." I promise you will not go wrong with any of the choices contained on this page; including the Porter Cable polisher we started with.